Panasonic TX-50CX802B review | What Hi-Fi? Last year, Panasonic was cursed with four-star fever. Its TVs were very good but superior sets from Sony and Samsung saw them fail in their bid for class-leading status. For this year’s flagship ranges, engineers have been hard at work on new panel technology and picture processing. A new ‘Super Bright’ LED panel featuring Wide Colour Phosphor technology, which combines LED backlighting with a new colour filter system, supposedly increases brightness without significantly increasing power requirements. So could 2015 be Pana’s year? A 40in model from one of its entry-level 4K ranges (TX-40CX680B) got top honours – and as we go bigger and higher up the range, we have another masterpiece. This time, it’s the TX-50CX802B. With 4K sets better than ever before, praising their performance with 4K material has become second nature. 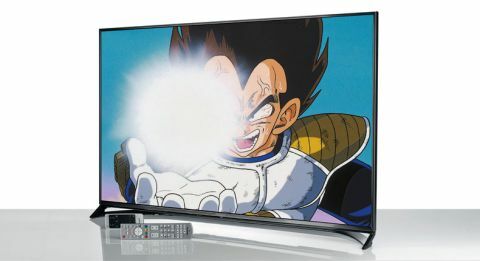 More importantly, though, they’re becoming better upscalers – it’ll be some time before Ultra HD overtakes Full HD as the most-watched resolution – and this is where the TX-50CX802B really shines. Play Dawn of the Planet of the Apes on Blu-ray and we’re faced with one of the crispest Blu-ray pictures we’ve seen on a 4K TV. Lines are drawn with rigour and fine detail spreads across the TV’s 8.3 million pixels. In close-up shots of apes, every wrinkle and scar is shrewdly etched, and whether it’s their wet shaggy fur, the bark on the trees or the moss that clings to deserted buildings, texture is palpable. It’s hard to believe the Pana is making up 75% of the picture. Colour performance is strong, the greens of the jungle and reds of bloodied wounds as solid as they are bright. We’d tone colour down slightly in the settings – using a THX Optimizer disc – and ensure picture mode is on ‘normal’ for the best balance. It’s hard not to be wowed by the contrast. Gleaming whites leap off the screen and blacks are some of the deepest we’ve seen – even if detail and clarity in blacks is more of a trade-off than we’d like. The Panasonic is just at ease with native content. Watch sci-fi drama Sense 8 on Netflix and it’s a clear step-up from the Blu-ray picture in terms of sharpness and insight. The opening montage of scenic clips from city skylines to waterfalls is awash with detail and subtlety, basking in razor sharp lines and lush, rich hues. For the meantime, standard-definition playback is still a compromise on a 4K TV – worth considering if you play a lot of DVDs. The Pana is as good as they get, though; the picture is clearly softer, but colours remain attractive and contrast is strong. A flatscreen telly’s speakers will rarely offer you the same weight or dynamic knowhow as a good soundbar, but the Pana’s sound quality won’t have you rushing out to get one right away. Satisfyingly clear and crisp, it has decent body to it and goes reasonably loud. Panasonic’s new Firefox-powered interface is a welcome one, its fuse of multi-coloured graphics and customisable pop-up menus attractive, intuitive and simple to operate. The home menu is simply a line of bubbles – or ‘decks’. Three of these – live TV, apps and devices – come as default, but anything from a TV channel to a web page can be ‘pinned’ to the menu in just two button presses. Holding down the remote’s ‘home’ button also prompts overlaying navigation bars to access local weather, recommended content, notifications and, finally, channels so you can scroll through them without disrupting what you’re watching. The Panasonic’s new smart remote invokes mixed feelings. We like how nice its subtly bendy body is to hold and its smart rubberised front adds a touch of class to its otherwise plasticky feel. Voice control is accurate and efficient. Simply say the name of the app or function you want to open, or the number that’s pinned to it on-screen, and hey presto. A courteous “thanks television” exits the feature. The trackpad replaces the on-screen cursor, giving your arms a rest and making your thumb do all work. The swiping motion isn’t always as quick at getting you from A to B, but the main niggle is how easy it is to make mistakes. More than once, we exited Netflix viewing by accidentally swiping or brushing past the pad. This is not a remote you’ll want to casually throw down on the sofa next to you. The regular tool is a good alternative, as is the Remote 2 control app (free, iOS and Android), which is fine for basic remote functions if you excuse its primitive interface. The app also lets you beam content from your device to the TV with a single swiping motion, provided both devices are connected to the same home network. YouTube, Netflix and Amazon Instant Video grant you an ever-growing catalogue of 4K content, as well as hours and hours of regular material. Freeview Play – a rebranded and renovated Freeview – will provide catch-up TV when the service launches later this year. Of course, there are plenty of inputs in which to plug your own content. Of its three HDMI inputs, all are HDCP 2.2 certified for compatibility with future 4K hardware (like Ultra HD Blu-ray players and set-top boxes) and one can be found on the side panel alongside its three USB inputs. Impressing in everything from sound to picture, interface to features, the TX-50CX802B is a solid package, making it two from two for Panasonic’s 2015 TV range.